It's the hap-happiest season of all at Disney World so we've put together this list of all that the Walt Disney World Resort has to offer this Christmas. Magic Kingdom - "A Frozen Holiday Wish" - 2019 Dates to Be Announced - A show featuring Anna, Elsa, Kristoff and Olaf on the Castle Forecourt Stage in the Magic Kingdom. Check the Magic Kingdom Times Guide for exact time during your visit. Not presented November 10 & 11, 2018 Click here for a list of places you can see Anna and Elsa at Disney World. Mickey's Royal Friendship Faire with Holiday Finale (Castle Forecourt Stage Show) - Offered multiple times daily - check your Magic Kingdom Times Guide for exact times during your visit. Jingle Cruise - Holiday lights, puns and jokes guaranteed to make you groan as the Jungle Book ride get into the holiday spirit. Holiday versions of the Move It! Shake It! Dance & Play It Street Party, the Dapper Dans, and the Main Street Trolley show. Check your Magic Kingdom Times Guide for exact times during your visit. Meet Santa Claus near the Tour Guide Gardens by City Hall on Main Street USA through December 24th. 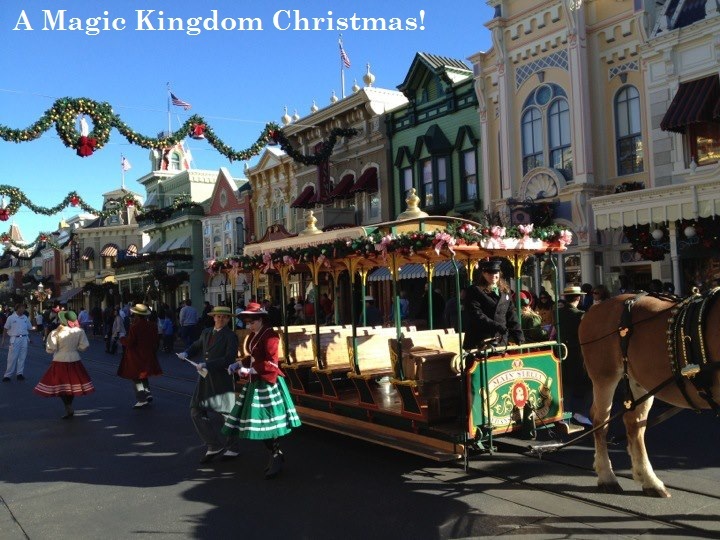 Mickey's Very Merry Christmas Party- Select nights at Magic Kingdom / 7PM - Midnight. 2019 Party dates: November: 8, 11, 12, 14, 15, 17, 19, 21, 22, 24 and December: 1, 3, 5, 6, 8, 10, 12, 13, 15, 17, 19, 20, 22, 2019. These specially ticketed events - you cannot use your Magic Your Way or Park Hopper Ticket - are a lot of fun for families. Ticket prices but start at $99 for advance purchases and $109 at the gate, depending on the party date and age of participant. These parties include special activities, shows, a parade, and special event fireworks. Warning: The Magic Kingdom will close to the public at 6pm on party nights and won't have fireworks on these nights. Restaurant reservations in the resorts closest to the Magic Kingdom fill early on these nights. In years past, there been a Wishes Fireworks Holiday Dessert Party at Tomorrowland Terrace on select party nights. Reservations are required and there is an extra cost; honestly, the dessert party is a nice choice if you have people in your party with stamina or mobility issues but is probably not a great value otherwise since you're already paying a premium for the Christmas party tickets. Mickey’s Once Upon a Christmastime Parade will be presented at 2019 Dates To Be Announced. The Disney Festival of Fantasy parade probably will not be presented on these days. Fantasy in the Sky Fireworks will be presented at 6:30PM and 11:50PM on December 30 & 31. Holiday Characters at Disney World - Disney Characters in holiday costumes and special characters only available during the holidays. Ye Olde Christmas Shoppe in Liberty Square features Disney ornaments, Christmas stockings and holiday items. Disney's Yuletide Fantasy Tour ($139 per adult) - Backstage 3-hour tour that let's you get a glimpse of the team and the details that go into making the Disney World parks and resorts so beautiful for Christmas. Call 407-WDW-TOUR for more information and to make a reservation. JOYFUL! A Gospel Celebration of the Season - Gospel, R& B and holiday songs - Future World Fountain Stage - Check times guide for exact times during your visit. Chip & Dale’s Christmas Tree Spree scavenger hunt. Purchase a map and stickers for $6.99 from Pin Central, Disney Traders or World Traveler at International and then head to the World Showcase where you’ll search for Chip & Dale as they gather ornaments from holiday decorations in each World Showcase pavilion. Once you find them, you’ll match the ornament sticker to the location on your map. When you’re done, take your completed map to Disney traders or World Traveler and exchange it for a festive surprise. One prize per map. Holidays Around The World - An International Yuletide Extravaganza - November 18 - December 30, 2018. Experience live musical productions, learn about international holiday traditions in the World Showcase Pavilions, and enjoy the delicious offerings (extra cost) at the Holiday Foods and Beverages Marketplaces. Holidays Around the World Storytellers - November 29 - December 30, 2019 - World Showcase Pavilions . Each performance is approximately 15 minutes long; check your Epcot Times Guide for exact times during your visit. Canada Pavilion - Canadian Holiday Voyageurs: A musical tour of the Great White North that explores holiday customs from various regions of Canada / United Kingdom Pavilion -Father Christmas tells tales of Christmas past. / France Pavilion - Père Noël tells the story of little Babette and her wishes at Christmastime. / Morocco Pavilion - A Moroccan storyteller shares the gaiety of festivals, holiday traditions and celebrations that are like the "spice of life" across Morocco. / Japan Pavilion - The Daruma Vendor tells the story of the Daruma doll. / American Adventure Pavilion - Santa & Mrs Claus appear daily, a Hanukkah storyteller tells tells the story of the rich Jewish traditions of Hanukkah, and a Kwanzaa storyteller shares the seven principles of Kwanzaa. / Italy Pavilion - La Befana tells the sweet story of how the Epiphany is celebrated in Italy. / Germany Pavilion - Helga tells about the first Christmas tree, the first Nutcracker and the Christmas pickle. A German band will play some of your favorite Christmas carols. / China Pavilion - a vibrant Chinese Lion Dance in honor of major Chinese holidays like the Lunar New Year and Lantern festival. / Norway Pavilion - Sigrid & Julenissen (Christmas gnome) tells you all about Norwegian Christmas celebrations. / Mexico Pavilion - Holiday Mariachis & Dancers present the songs and traditions of "Fiesta de Navidad". Epcot: Voices of Liberty Christmas Carols - American Adventure Pavilion. Check your Epcot Times Guide for exact times during your visit. Meet Santa & Mrs. Claus at posted intervals n the American Adventure Pavilion at Epcot. Illuminations: Reflections of Earth with special Holiday Finale - May not be offered this year since IllumiNations is being discontinued. Disney's Holiday D-Lights Tour ($279 per adult in 2018) - Experience the Candlelight Processional (Epcot), Jingle Cruise (Magic Kingdom), enjoy a family-style holiday dinner, and meet members of the Event & Decorating Support team who create all this holiday magic. Call 407-WDW-TOUR for more information and to make a reservation. Sunset Seasons Greetings - Sunset Boulevard - 2019 Dates to Be Announced. Enjoy colorful projections on The Hollywood Tower Hotel. Billboards suddenly begin to move and tell a tale, "snow" and laser projections. "Jingle Bell, Jingle BAM! ", - 2019 Dates to Be Announced. A Santa-sized evening Spectacular featuring holiday music, special effects, projections, and fireworks. Minnie's Holiday Dine at Hollywood & Vine - 2019 Dates To Be Announced. Character dinner - cost: $59.99 per adult / $35.00 per child age 3 - 10; advance reservations strongly recommended. Meet Santa Claus 2019 dates to be announced. Meet Santa Goofy from Dec. 25 - 31, 2019. Up! A Great Bird Adventure - holiday edition which features the story Diwali, an Indian Festival of Lights. Special animal themed Christmas tree near the park entrance. Disney-themed Disney Springs Christmas Tree Trail - 2019 Dates To Be Announced from 11am to 11PM daily; Begin this delight for the eyes at the play fountain outside Once Upon a Toy in the Marketplace. Tree Lighting Ceremony at 6pm nightly. Meet Santa at Disney Springs (formerly Downtown Disney) - Santa's Chalet at this year’s Marketplace Christmas Tree Trail - 2019 Dates to Be Announced; 11AM to 11PM. Meet Santa Goofy from December 24 - 30, 2019. Photos included in the Memory Maker package. No need to wait in line! Simply check in at the podium and provide your mobile phone number to the attendant and go enjoy the Disney Springs area; you’ll receive a text letting you know that you have 10 minutes to return to meet Santa. Click here for more information. Live Entertainment including toy soldier and snowflake stiltwalkers, carolers, acapella groups and more from 6PM to 10PM most days, from 1pm - 5pm on December 31st. Stitch’s Holiday Gift Hunt - 2019 Dates to Be Announced. Embark on a merry mission ot lacate all the items on Stitch’s lost list by picking up a pocket-sized booklet with a map, clues and stickers at any of the 18 participating Disney Springs locations and spotting the hidden stitch holding one of this presents and matching the correct sticker to the corresponding location. Once you’ve successfully completed the booklet, head to the redemption center to collect a festive surprise; one prize per completed booklet. Click here for more information. T-Rex is offering a Breakfast buffet with Santa on 2019 to Be Announced. This experience comes with early-bird shopping at The World of Disney Store. Cost: Adults: $30 each / Children (4-9): $18, tax & gratuity included. Click here for reservations & more information. Disney's Days of Christmas store in the Marketplace - full of ornaments, stockings and Disney-themed holiday decor. Christmas Church Services in the Fantasia Ballroom at Disney's Contemporary Resort on December 25. Catholic Mass and Protestant Service at (times to be announced). Parking is restricted at Disney's Contemporary Resort so please use Disney World transportation to get to the resort or go to the Magic Kingdom and follow the walking trail to the resort. Holiday Decorations and Displays in the Disney World hotel lobbies, especially the deluxe resorts. Disney's Grand Floridian has a 16-ft tall gingerbread house; Disney's Animal Kingdom Lodge also gets a beautiful themed Christmas tree. Disney's Wilderness Lodge has a 60-ft. Christmas tree. Disney's Beach Club Resort has a large gingerbread carousel and Disney's Beach Club Resort has a holiday train display. Disney's Contemporary Resort has a gingerbread and chocolate holiday village near the monorail platform. Are you staying at an official Walt Disney World Resort hotel? If so, check the resort recreation guide you were given at check-in for special holiday events like Santa meet-and-greet sessions and cookie decorating during Christmas week. Holiday Sleigh Rides - Up to four (4) adults or two (2) adults and (3) three small children can enjoy a 25-minute ride through the woodlands surrounding Disney's Fort Wilderness Resort & Campground in carriage made to look like a one-horse open sleigh with festive holiday lights and garlands. 2019 Dates to Be Announced. Cost: $ - call (407) 939-7529 for reservations. Disney's Winter Summerland Miniature Golf Course - Two Santa-inspired 18-hole miniature golf courses located near Disney's Blizzard Beach water park. If using Disney transportation, check with a cast member about the best way to get here. You'll probably have to take transportation to Epcot and then catch the Coronado Springs/Blizzard Beach bus and ask the driver to drop you off at Winter Summerland. If you're at one of the other Disney theme parks, you may need to take a bus to Disney's Coronado Springs resort and transfer to another bus there. Atlantic Dance Hall’s New Year’s Eve Bash at Disney’s Boardwalk Resort includes a light-bite menu, 2 beverage vouchers, champagne toast at midnight, music with live video DJ, party hats, party horns and a great view of the Epcot fireworks. Must be at least 21 years of age with valid photo ID to attend. Advance reservations required; cost: $ per person = tax. New Year's Eve Party: Countdown to Midnight - December 31 in the Fantasia Ballroom at Disney's Contemporary Resort - $ per guest. Enjoy sensational seasonal cuisine, live music, dancing, and photo opportunities. Must be at least 21 years old. Dress code applies. New Year’s Eve Fort Wilderness Beach Dessert Party - December 31 from 10PM to 12:30AM at Clemenine’s Beach at the Fort Wilderness Resort. Reservations required. Cost: $ per adult & $ per child, not including tax. Freshly prepared desserts, seasonal fruits, flavorful cheeses and beverages including beer and wine will be served. Guests must be 21 years or older and present a valid form of ID to confirm age to consume alcoholic beverages. Best Kept Secret for a Magical Disney World Vacation!